Double wall ovens have two separate ovens, so you can cook foods at two different temperatures or bake in one while you broil in another. This offers a lot of capacity, but you'll need to have a larger space in your kitchen to accommodate the bigger unit. Most double wall ovens still measure 30 inches wide, but they are around 50 inches tall (compared to about 30 inches for single wall ovens). If you think a single wall oven will best suit your needs, head on over to our single electric oven or our single gas oven recommendations. Among double wall ovens, we found the best feedback by far for the GE Profile PT9550SFSS (Est. $3,500), which provides five cubic feet of capacity in both the upper and lower cavities. It's a strong performer overall, and one that's feature packed -- including the ability to be controlled by a smartphone. In testing, the GE PT9550SFSS earns very high marks, including Recommended status at Consumer Reports, where cooking performance is rated as Very Good across the board. Compatibility with GE's Brillion smart appliance app also draws the attention of technology reviewers like CNET, where the PT9550SFSS earns a 4-star rating, and Digital Trends, where it is an Editors' Choice. These two reviewers spend a lot of time looking at the advanced features that this double oven brings to the job of cooking your family's dinner, but they also pay attention to how well it handles the actual cooking. Though there are high point and low points in CNETs detailed and comparative baking, broiling and roasting trials, Megan Wollerton says that the PT9550SFSS "consistently performed well during our testing and produced very tasty results." While there's sometimes more than six degrees of separation between how experts and users view any product, users are, if anything, even more impressed with the GE PT9550SFSS. It's been around long enough to amass a good number of reviews, and its ratings are high -- for example, 4.6 stars based on 200 user reviews at Home Depot. Owners particularly praise its attractive appearance, spacious capacity, flexible cooking options and, of course, the smart features that allow them to control preheating, adjust temperatures and more -- and they can do so from their smartphone, or even under voice control using GE's Geneva voice control "assistant" and an Amazon Alexa or Goggle Assistant enabled device. Wollerton calls out the Brillion app, too. "The app allows you to preheat your oven, get alerts when your food is done, and change the oven temperature all from your Android or iOS device," Wollerton notes. Ian Tucker at Digital Trends gripes about some quirks in getting the app to communicate with his test oven -- complicated by running it initially on an iPhone with a dated version of its iOS operating system (it's designed to use iOS 6 or later) -- but reviewers all report that the app is fairly simple to use. "Some users may find Brillion to be more trouble than it's worth, but once connected, the app's interface provided us with most of the options available on the oven's own interface," Tucker says. But as brilliant as Brillion might be, it's everything else that's packed into this GE wall oven that might make you a cooking star. The upper and lower oven both have "true European convection," which directs heated air from around a single element evenly around food, as well as convection broiling, which employs two heating elements. The oven is self-cleaning, with both a 30 minute steam clean cycle for light soiling and a traditional cycle, which can handle tough build up -- but can also take up to five hours to finish. Though CNET complains a little about the layout of the control panel on the GE PT9550SFSS, usability is generally judged to be excellent by reviewers. Even owners who are initially intimidated by all its features say it's very easy to use once you get used to it. One neat feature is a red LED status bar that tracks the progress of the upper oven. "It's a pleasant way to get essential information from across the kitchen, even if it does make the oven look suspiciously like a dreaded Cylon," Tucker says. Bright halogen interior lighting allows you to watch your food through the oversized glass windows in both oven doors -- though we did see a just a couple of owner complaints that the light was actually too bright for their taste. If you're not interested in being able to sync your oven with your smartphone, the KitchenAid KODE500ESS (Est. $3,500) is a very well-reviewed choice. It's also Recommended at Consumer Reports, where, in testing there, it gets scores of Excellent for broiling and Very Good for baking. Owners seem to be pretty thrilled with the KitchenAid KODE500ESS, with hundreds of reviews spotted at sites like Home Depot, where it earns a score of 4.5 stars following more than 440 reviews. Most praise its versatility and even cooking performance. Some, in fact, say they overcooked things at first because they were accustomed to having to make adjustments with their previous ovens. People who entertain a lot or host holiday gatherings are particularly pleased with this spacious double oven -- both ovens have a five cubic foot capacity. They also like its good looks. Although the KitchenAid KODE500ESS doesn't pair with an app and can't be operated under voice control, it's otherwise just as fully-featured as the GE PT9550SFSS, with true convection cooking, a self-cleaning cycle, a hidden bake element, and easy-glide racks in both ovens. We review the stainless steel finish here, but it also comes in black as the KitchenAid KODE500EBL (Est. $3,500), black stainless as the KitchenAid KODE500EBS (Est. $3,600) and white as the KitchenAid KODE500EWH (Est. $3,500). Many people buy double wall ovens for their high-end looks and loads of features, but you can get a wall oven for $2,200 or less -- and often under $2,000 when on sale -- that performs just as well -- and looks just as good -- as more expensive ovens. The trade-off for the lower price is usually fewer features, but for some who only use the basic oven cycles, that shouldn't be a deal-breaker. That said, you don't give up much with the Frigidaire FGET3065PF (Est. $2,200). It's feedback from owners slightly trails the ovens above, but it's still pretty good in its own right, and Reviewed gives it a pretty positive review, too, with tester James Aitchison saying it's "attractive and relatively affordable." Performance isn't perfect, but this Frigidaire double wall oven still holds its own against similar models. Digital Trends, for example, notes that the ovens needed to be recalibrated (a relatively easy task, Jenny McGrath says) to bring them in line with readings on an analog thermometer used in the site's testing. "Once the thermometers synced up, both the convection and traditional settings worked well," McGrath adds. Despite its relatively affordable price, this Frigidaire double oven is fully-featured (although there are no "smart" abilities), with convection cooking capabilities, a quick preheat setting, delayed start, slow cooking, and a temperature probe (upper oven only). There are both steam and regular cleaning cycles. Capacity is a little lower than the two ovens above, but with dual, 4.6 cubic foot cavities, it is still plenty ample, and some helpful touches -- such as a half-depth rack -- improve versatility. This is the stainless steel model. It also comes in black stainless steel as the Frigidaire FGET3065PD (Est. $2,300), black as the Frigidaire FGET3065PB (Est. $2,100) and white as the Frigidaire FGET3065PW (Est. $2,050). While the MSRPs seem high, we spotted all of these ovens on sale for $2,000 or less (depending on color) at the time this report was compiled. If you are looking to spend even less, the Whirlpool WOD51EC0AS (Est. 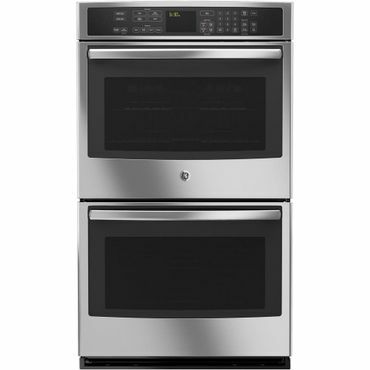 $2,050) is the least expensive double wall oven to earn Recommended status at Consumer Reports. There, editors award it scores of Excellent for broiling and Very Good for baking. The big thing missing compared to the Frigidaire is its lack of convection cooking, but the oven is otherwise relatively feature rich, including steam cleaning, an Accubake temperature monitoring system, 10 cubic-foot capacity (5 cubic feet in each oven), extra-large oven windows, and more. If there's a red flag it's that its owner ratings are a little concerning at first glance. A closer look, however, finds that, in fact, most are pleased with performance. It's the oven's noise that draws some ire, however; we saw quite a few comments about the "jet engine" loudness of the fans, that start up when the oven is turned on, and continue for quite a while after it's turned off. While we saw a lot of complaints about noisy fans when compiling this report, this particular oven's noise seems to really drive some people over the edge. The WOD51EC0AS is the double oven version of our Best Reviewed budget single electric wall oven, the Whirlpool WOS51EC0AS (Est. $1,300), and that oven also gets a lot of noise complaints. Still, as we said, most are happy (and don't even mention the noise) saying the Whirlpool WOD51EC0AS is very easy to use, the temperature is mostly accurate, and they love having the flexibility of a double oven -- especially an attractive, stainless steel one -- at a relatively affordable price (we spotted it on sale at less than $1,850 at the time this report was compiled). It also comes in black as the Whirlpool WOD51EC0AB (Est. $1,850) and white as the Whirlpool WOD51EC0AW (Est. $1,850), and we spotted both ovens on sale for less than $1,675 while researching this report. Good to great cooking performance. Cooking features that allow versatility.